Even though Clumber spaniels are quite uncommon, there are enough of them to foster the development of a distinct working type and a distinct a conformation type. It is not as extreme as it is with English cockers and English springers, but it exists. The conformation type is heavier-built and approaches the St. Bernard in conformation. The working type is more moderate in build, as one can see with this retrieving Clumber. It is amazing to me that these two types have evolved, and rarer breeds tend to remain more or less similar in appearance. One only has to look at flat-coated retrievers to see that this breed doesn’t vary as much in type as the closely related goldens and Labradors do. Rarer British gundog breeds and those from the European continent tend to have less divergence in type than the more common British breeds. It would be interesting to find out why Clumbers have started down this particular split. This breed is the traditional working spaniel in the UK, and it is very likely that certain strains existed solely for work. And from those strains, this type of Clumber developed. I am having some difficulty determining which type came first. 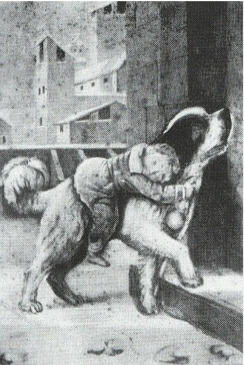 Historical depictions of this breed include both gracile and heavy-set forms. If anyone knows any of the details about this painting, I’d love know about them. These Clumbers appear to have sabling or perhaps tricolor in their spotting. I wonder if Clumber spaniels might have a bit of old herding bulldog in their ancestry. Tradition says these dogs came from France and were owned by a noble who sent them to the Duke of Newcastle in order to save them from the Revolution. I’ve never heard of such dogs in France. In fact, I don’t know of a single flushing spaniel breed from France. All of the epagneuls point. I wonder we could create a spaniel like this by crossing the red and white spaniel that is endemic to Britain with the biddable herding bulldog that was once relatively common in the English countryside. I have no evidence, but my historical imagination is ruminating. 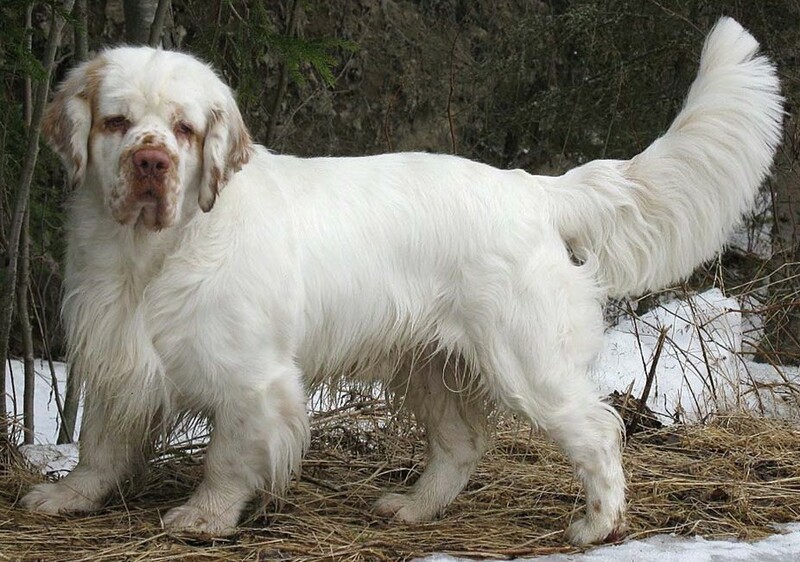 Breed historians who explore the origins of the St. Bernard and the Clumber spaniel run into something a little bit strange. 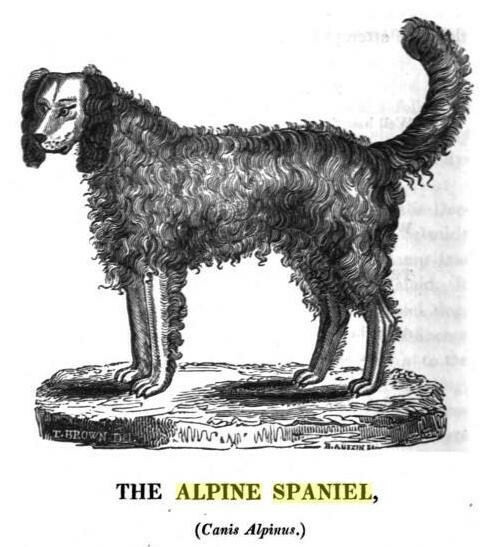 It turns out that an ancestor of both breeds is a dog called an Alpine spaniel. 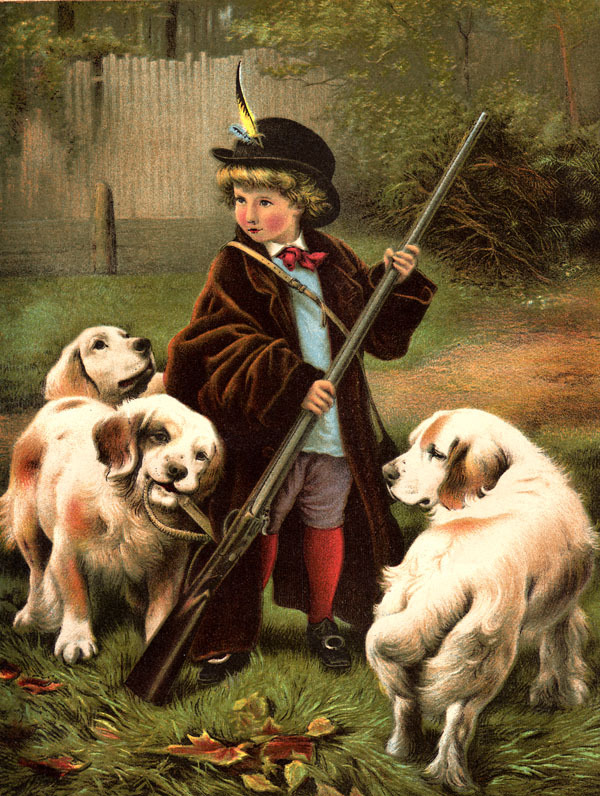 The dog featured in the 1829 depiction above looks a bit like a spaniel or some other form of gun dog. Now, here’s something shocking. It may be that the actual dogs that did the rescuing from avalanches at the St. Bernard Pass were actually spaniels. Yes, Alpine spaniels. What about Barry the St. Bernard? Wasn’t he a mastiff? That’s an actual dog at the Great St. Bernard Hospice. It’s very different from the St. Bernard we have today, but it was probably very different from Barry. 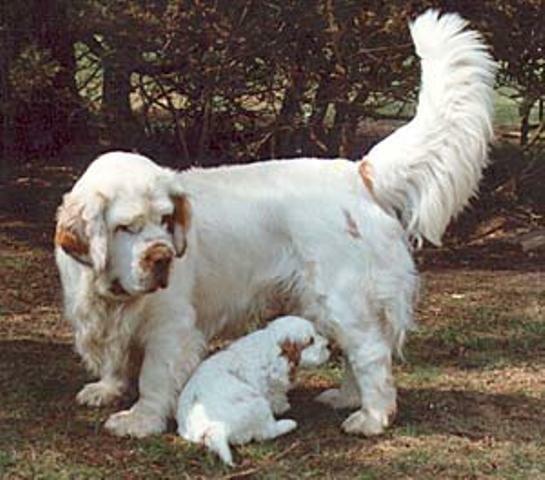 It’s very likely that the ancestral St. Bernard dog were Alpine spaniels that were crossed with Sennenhund-type dogs. Keep in mind that, only two breeds of Sennenhund (the Bernese and Greaters Swiss) are very large dogs. The Entlebucher and the Appenzeller are smaller dogs. It makes sense that the monks would have crossed spaniel-type dogs with these multipurpose farm dogs. The spaniel-type dogs are easily trained, as are the Sennenhund-types. The monks wanted a dog with the spaniel’s ability to air scent, but they also wanted a dog that had a bit more volume to it that could handle the very harsh conditions of the Alps. Also, most of the native Sennenhund breeds are smooth-haired, which was an asset for any dog working in heavy snow cover. Heavily feathered dogs tend to collect snowballs and ice in their fur. I submit that the ancestral Alpine spaniel and St. Bernard dog was a mixture of these spaniel and Sennenhund dogs. That is why analysis of the skulls of the dogs from the St. Bernard Pass that have been kept at the Natural History Museum at Bern varied between spaniel and mastiff-types. Which brings us to the noted search-and-rescue dog named Barry who was born in 1800. The famous story is that Barry rescued 40 lives in the mountains, and that he died rescuing the 41st. Usually, it is said that an escaped convict killed Barry, or someone mistook him for a wolf and shot him. In reality, Barry was given a retirement from rescue work when he was 12 years old, and he was sent to Bern to live out the rest of his life. When he was 14, he died, and he was preserved as a taxidermied specimen. He was put on display at the Natural History Museum in Bern in 1815, and his remains were displayed there until 1926. His taxidermied form was refurbished, and it was intentionally redone to make him look more like a modern St. Bernard. In 1926, the St. Bernard is a popular pet dog worldwide, and the dogs at the hospice look like the 1919 photograph. Here’s his original taxidermied form. The Natural History Museum in Bern estimates his original size to have been between 40 and 45 kilos (88 to 99 pounds). That’s much smaller than the typical St. Bernard. Also note that he lived to be 14. The average life expectancy for a St. Bernard is 6-9 years, depending upon which survey data one is using. 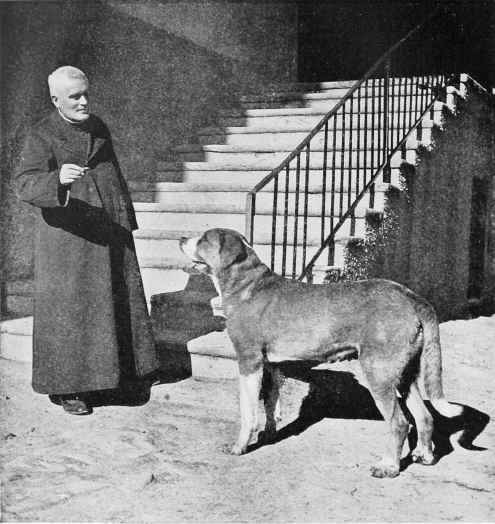 His head was very different from a St. Bernard as we know them today, and he lacks the black mask that we now associate with the breed. So how did the breed become the big mastiff that we know today? Well, keep in mind that the Swiss did not invent the dog fancy. The Swiss were more interested in producing a dog that could do its work. In 1830, the monks began breeding their dogs with Newfoundland dogs. Now, Newfoundland dogs are also a cross between a mastiff-type dog and a dog that had some gun dog ancestors (St. John’s water dog). This breed was a common pet in nineteenth century Europe, and the tendency was to focus more its mastiff ancestry than its water dog ancestry. It wasn’t long before St. Bernards stopped having any spaniel features at all. The Newfoundland cross is said to have reintroduced the long-haired gene into the St. Bernard/Alpine spaniel. The long-haired dogs were given away or sold to visitors and dog dealers, simply because the heavy feathering was so much of a disadvantage in the snow. 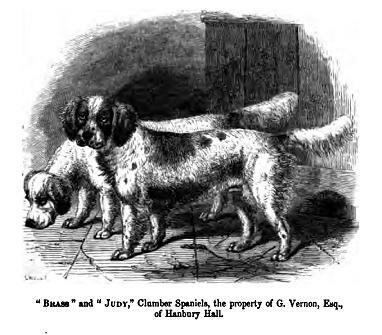 The dogs made their way into the British fancy, which then based its whole concept of the Alpine Spaniel on these dogs. Because the dogs really weren’t that much like spaniels anymore, they started calling the St. Bernards. And this breed became very popular worldwide. It was known for its intelligence and gentle temperament, but it soon became known for its large size. It wasn’t long before this breed became one of the largest in the world and became very different from its ancestors. Now, although the story of the Alpine spaniel’s more famous descendant is not that well-known among its fanciers, the other descendant’s patrons understand it perfectly. The other descendant actually became a working gun dog. Although there is not much evidence that the Swiss used the Alpine spaniel as a gun dog, the fact that its ancestors included dogs of the spaniel-type meant that it could be used as a flushing dog. Compare that Clumber in the painting above with this Alpine spaniel. The Clumbers are supposed to have Alpine spaniel blood. Clumbers were supposedly developed by the Duc de Noailles, a French nobleman who was marshal of France when the monarchy was overthrown. The dogs were sent to England to save them from the French Revolution. (The Duc died in 1794, and most of his family wound up guillotined. It is interesting that he saved his dogs, but he couldn’t save his family!). The dogs wound up in the hands of the Duke of Newcastle, who kept them at Clumber Park in Nottinghamshire. I have some problems with the French theory of the Clumber’s origins. France has no tradition of flushing spaniels. All the epagneul breeds from France are bred and trained as index dogs, including the Pont-Audemer spaniel, which is a water spaniel. The British do have a tradition of flushing spaniels, and it seems more likely that the dogs have a British origin. It is possible that the Duke of Newcastle got some Alpine spaniels from the French. Perhaps the Duc de Noailles did have some Alpine spaniels that he had to send to England. Whenthey arrived in England, they were bred to other spaniels to make them flushing dogs. I doubt that bassets played much of a role in its development, simply because many land spaniels in the Britain in the mid-nineteenth century had already been bred to have short legs. I don’t see why it takes the addition of basset blood to make the Clumber short-legged. It could have easily received that trait through selective breeding or through later outcrosses with short-legged spaniels of other strains. Notice that the dogs look as if they have the features of spaniels and St. Bernards. And I think that might not be a bad way to think of St. Bernards and Clumbers. Clumbers and St. Bernards are very different dogs today, but they come from a common ancestor, which included both mastiff and spaniel features. The dog that became the modern St. Bernard drew heavily on its mastiff heritage until it began to lose its spanielness, and the Clumber is a spaniel that looks a bit like it had a St. Bernard somewhere in its background. I no longer believe the things I have written in this post. I need to make a revision at some point. 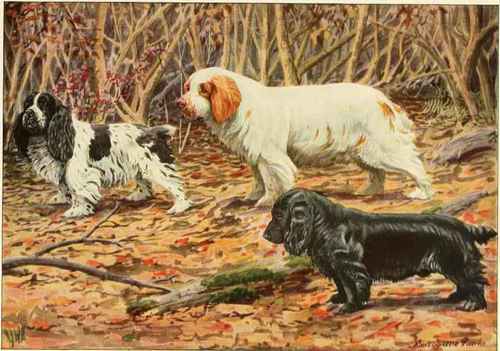 Clumbers likely derive from aboriginal English red and white spaniels. It is very unusual for a rare breed to develop distinct working and show forms. 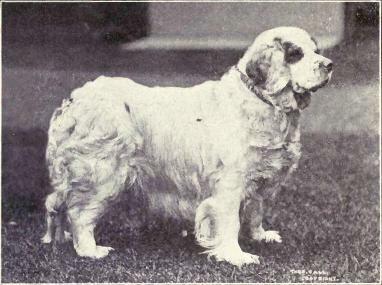 However, the Clumber spaniel is splitting into show and working forms, just as the English springers and cockers have. The working form of Clumber has longer legs and less bone than the show form. It is still a slower dog than the others. However, it’s not the St. Bernard of spaniels that the show form is. If you want soft-flushing dog that doesn’t move very fast, go with one of these. Check out these galleries and this website. Why are these dogs so different from the show dogs? Well, they started breeding the dogs for working ability, and the dogs changed. Form follows function. The tootsie roll spaniel, the breed most often compared to the Clumber, has not experienced any significant breeding for working ability in the past half century. Virtually every person who has one of these dogs is breeding it for the show ring with working ability being incidental (and virtually every person who has one is trolling this blog.) I’m sure someone can find a Sussex that works. That’s not the point. This breed is on the verge of extinction because it was part of the nineteenth century fad of breeding short-legged spaniels. Here’s footage of a Clumber hunting. Compare it with the working cockers in the earlier post. These dogs operate in very different manner. I’ve never seen a flushing dog operate with such sedation! I have always wondered about this breed. Most of the gun dog breeds are similar in temperament. The Chesapeake Bay Retriever is an outlier, because it’s far more protective than any of the other breeds in the gourp. The Clumber is also an outlier in that it apparently always worked game in this slow fashion. Now that it’s no longer being bred for that purpose, my guess is that it is even more sedate. All sorts of theories exist about its origins. 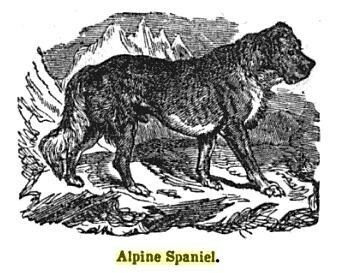 One is that a breed called an Alpine Spaniel, which I’ve never heard of and there’s no record of, was the ancestor of the breed. I wonder if this isn’t a cross between a St. Bernard and spaniel. The Clumber is almost exactly like a St. Bernard in behavior, just it has a spanielness to it. May there’s a touch of basset in the dog, too. Whatever it is, my guess is most modern gun dog fanciers will go with springers. This dog is a museum piece. It has a wonderful history, but in utility, it’s certainly lacking. BTW, flews have little to do with soft mouth, as I’m sure all the retriever people who saw this video screamed when they heard that part. If this were true, all the retrievers would have heavier lips than any mastiff. I have actually never seen a Clumber retrieve shot game, but maybe they do. I’ve only actually seen one Clumber in my entire life, but it didn’t act anything like what I expected a gun dog to act like. Now this breed does well at conformation shows. One won Westminster a few years back. He’s depicted in that video, as is the one that won Cruft’s. Now, as a pet, my guess is that such a sedate dog would be a better choice than a golden retriever or a springer spaniel, which are far more active dogs. It’s likely that this breed will be pet rather than a hunting dog, especially when it lacks the biddability and speed of all the other spaniels used for flushing.